In the fifties Harold Wilmot, lead singer of the Fifties hit group The Southlanders, determined to make permanent the autographs of some of the great artistes of the time, as a special kind of History of Entertainment. His way of doing this was to carry a tablecloth with him to every venue at which he appeared and obtain the signatures of the famous on the cloth. He would then embroider over the names, creating a permanent record in a most unique way. The Tablecloth reads like a Roll of Honour of the Entertainment business with names like Jimmy James, Eddie Reindeer, Tommy Trinder, Albert Modley, Richard Murdoch, Tessie O'Shea, Ken Platt, Leslie "Hutch" Hutchinson, Arthur Downer, Reg Dixon, Valerie Gray, Joe Douglas, Jimmy Clitheroe, Max Miller, Mantovani, Bob Hope, Alma Cogan, Benny Hill, Anne Shelton, Morecombe & Wise, LitaRoza, Sid & Max Harrison, Ted Lune and Frankie Vaughn. 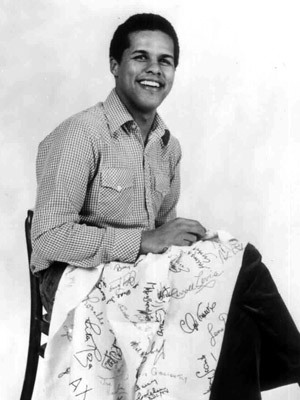 Since inheriting this very special tablecloth, Gary has kept up the tradition and some of the names he has added include Les Dawson, Englebert Humperdink, Tony Bennett, Milton Berle, Roy Hudd, Roger Miller, Dukes & Lee, Harry Secombe, Roy Kinnear, Jimmy Tarbuck, Jack Klugman, Martha Reeves, Michael Aspel, Norman Wisdom, Cliff Richard, etc. 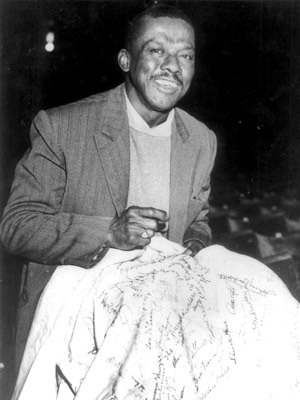 In any gathering of people, whether showbiz or not, when the Tablecloth comes out it creates nostalgia and brings untold stories surrounding the great personalities who have penned their names in this unique fashion. The tablecloth, which is about 5ft square and has around 400 autographs, has gone missing. The tablecloth went missing possibly as far back as Gary's 1995/96 panto season in Birmingham and he's very keen to recover it as it has great sentimental value. If you can shed any light on this please let Gary know by using the form on the Contact Page.